Is race purely about the races in your family tree? A new Pew Research Center survey of multiracial adults suggests there’s more to racial identity that goes beyond one’s ancestry. The survey of 1,555 multiracial adults found that three-in-ten say they have changed how they viewed their racial identity over the course of their lifetimes. About one-in-five multiracial Americans, including about a third of all black mixed-race adults, have dressed or behaved in a certain way in an attempt to influence how others see their race. Taken together, these findings suggest that, for many multiracial Americans, racial identity can change over the life course. It is a mix of biology, family upbringing and the perceptions that others have about them. These efforts to change or clarify how others saw their race varied widely across the largest multiracial groups. Among black multiracial groups, 32% have looked or acted in ways to influence how others perceived their racial background. That includes 42% of black and American Indian biracial adults, 33% of those with a white, black and American Indian background, and 20% of white and black biracial adults. A quarter of white and Asian biracial adults say that, at some point, they have tried to look or behave a certain way to influence how people thought about their race. Among the largest biracial subgroup – white and American Indian adults – only about one-in-ten (11%) say they have done this. A third (34%) of Hispanics who report two or more races also say they have made an effort to change the way people saw their race. In addition to looking or acting in ways to shape how others saw their race, about three-in-ten multiracial Americans say they have changed how they view their racial identity over time. Some 29% of mixed-race adults who now report more than one race for themselves say they used to see themselves as just one race. 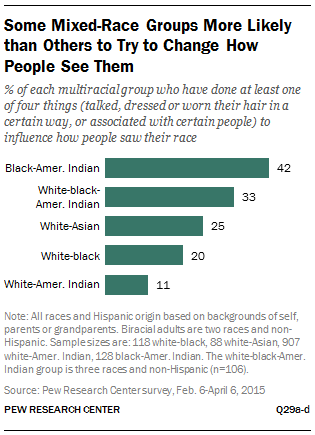 But among those who have parents or grandparents of a different race, an identical share have switched their racial identity: 29% say they once saw themselves as more than one race but now see themselves as one race. The Census Bureau also found that more than 10 million Americans changed their race or Hispanic origin in 2010 from what they had reported in the 2000 census. About the Pew Research survey: These findings are based on a nationally representative survey of 1,555 multiracial Americans ages 18 and older, conducted online from Feb. 6 to April 6, 2015. The sample of multiracial adults was identified after contacting and collecting basic demographic information on more than 21,000 adults nationwide. Margin of sampling error for the overall results is plus or minus 3.8 percentage points and larger for subgroups.